What should the average citizen know about US War Crimes? What should the average citizen know about US war history? What is the leverage point for Occupy’s victory? In our current debt-based monetary system, we're never going to pay off the national debt. The debt-deal political theater is a tragic-comedy and essentially lies of omission and commission costing Americans trillions of their dollars every year. The heart of the lie is Orwellian: US “leadership” tells us that debt is a “money supply,” repeats it through complicit corporate media, and parasitizes US tax payers as their debt slaves. It’s also criminal fraud in the trillions of dollars in public damages that kills millions of human beings every year. The truth shall set us free, when enough Americans demonstrate the intellectual integrity and moral courage to see what’s right in front of everyone, factually state “the emperor has no clothes” facts, and demand the obvious solution of ending debt and creating money. The US suffers from debt-damned economics: a Robber Baron-era paradigm whereby the harder Americans work, the more in debt we collectively descend. The reason is public confusion between “money” (which the US does not create and use to facilitate trade) and “debt/credit” (which our government says is “money” and what is created). Our modern-day Robber Baron/oligarchs maintain this confusion with the willing help of US corporate media’s intentional obfuscation. Here’s an interview to hear me discuss our predicament and obvious solutions. Americans could have full-employment if government created money, and employed anyone interested for infrastructure improvement (hard and soft). Below is an article I wrote in 2009 (slightly revised) to explain this accomplishment is as easy as the sentence above describes. For my comprehensive explanations on economic solutions, read this and this (and here for foreign policy interests, here if you’d like me to verbally explain all this from a radio and podcast interview). Because what US “leadership” does rather than these easy solutions are criminal acts that every year kill millions, harm billions, and loot trillions of our dollars, I advocate for revolution. Revolution stops all allegiance to a government’s crimes and criminal leaders, and demands prosecution - or because both political parties are so deeply criminal - Truth and Reconciliation. 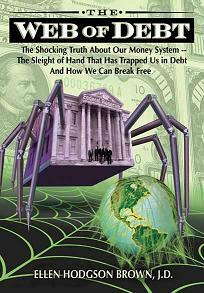 Radical Alternative to Perpetual Economic Slavery of the "Bailout"
The paramount reason for today's cancerous credit crisis is seldom even hinted and never explained. First, a simple definition. A credit default swap is a form of insurance. A variant of mortgage insurance required of many home purchasers. An insurance policy that requires a company with financial strength to step up to the plate and pay the mortgage if for some reason the home buyer defaults. A credit default swap is similar: If default occurs, an insurance company pays the income stream of the mortgage. With one extremely important difference: Payments are made to the owner of the policy, not to the financial institution that stands to suffer a loss. Financial institutions are allowed, through total lack of regulation, to buy and sell credit default swaps, or insurance they will be paid in event of default, on financial instruments in which they have no financial interest. Vancouver BC - Today various members of the Vancouver 9/11 Truth Society got together at Queen Elizabeth Park to brainstorm various ideas about how we (Canadians) should rebuild our economic and political structures for the coming Post 9/11 Truth World. 9/11 may have thus far changed Canada – and America for that matter – for the worse, but it has also helped millions of us open our minds to the truth behind government secrecy and corruption like never before. 9/11 Truth will open many doors to the possibilities of a restructured government that have not been opened since the founding of our nation. This, combined with modern communication capabilities, can give us an opportunity like none other in the history of modern civilization. Now is not too early to think about which doors we would like to venture through, and which ones are better left to be left behind. Listen 9:00- 11:00 pm (CST) to the WeThePeopleRadioNetwork.com and to our guest in the first and second hour- Ellen Hodgson Brown on "Rethinking Money." Nobel Peace Prize Winner Yunus was principal technical advisor to a project I undertook to establish a microcredit program at the Agency for International Development in 1987. We worked together for a few years (1985 - 1990 and since), and Yunus on several occasions, stayed in my house in Gaithersburg, when he was visiting Washington DC. I was delighted to learn that he has finally won the international acclaim that his extraordinary achievement has long deserved. But it should have been Economics and Peace. If ever a man deserved a double from the Nobel Committee it is Dr. Muhammad Yunus, professor of economics, Chittagong University, founder and Managing Director of the Grameen Bank, Bangladesh and of the Grameen Trust. (Grameen = village, rural). The Grameen Bank in Bangladesh is the most successful human endeavor in existence. Working in the poorest country in the world (in 1974 a famine killed more than a million people in Bangladesh) and with no more than $27, Yunus created a miracle. Astonishing ingenuity, combined with radical faith in his fellow human beings led him to an economic discovery that could rightly be considered the exact opposite of economics as we know it.